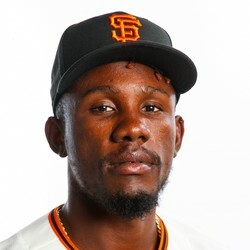 With a straightforward personnel move Tuesday, the Giants recalled utility man Orlando Calixte from Triple-A Sacramento, where he had been among the affiliate's top performers if not its very best, and he wasted no time making an impact in a 6-3 loss to the Nationals. Calixte, 25, started in left field and led off, notching his first Major League hit, a single off left-hander Gio Gonzalez, leading off the bottom of the first, then added a two-run double in the second to put the Giants on the scoreboard. With AAA Sacramento, he compiled a .287/.331/.507 slash line in 41 games, along with eight home runs, 26 RBIs and 11 stolen bases in 12 attempts.